Imagine this – you walk to your coffee pot and add top-shelf coffee grind. You then press the brew button and it fills your insulated mug all by itself… does it all without you having to add water. That is what we all want I think. First thing in the morning it’s certainly what I want. I sure don’t want to have to prep so much right out of bed. The thing is though that this is not a dream. You can have a plumbed coffee maker with a direct water line connection and it doesn’t take a professional to install it either. In this article I’ll show you some options that should work right out of the box making your morning a little nicer. 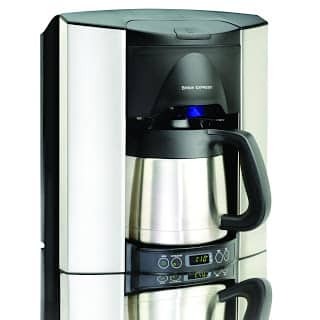 If you want to upgrade your coffee maker at home to a system that includes a connection to your water line then you are going to have be a tiny bit comfortable with light plumbing. Much like you would hook up a water line to a fridge or to a dishwasher you will do the same to your coffee pot. This job might be a stretch for some people but for the vast majority pf people it’s going to be just fine… so long as you don’t want it recessed into the wall. Hooking up a coffee maker to your home’s water supply is not rocket science. If you start with a good machine that is built to handle this setup then it’s really all about following the instructions and buying the right accessories. the correct fittings for your line. All of these should easily be found on Amazon or a local plumbers supply store – probably even your local Home Depot. Here are some of the best home coffee makers for sale today that easily hookup to water supply lines. I particularly like the single-cup machines because they enhance the already super convenient nature of the machine. If you go this route you must also purchase the Keurig plumb kit which is basically a replacement water reservoir designed for the water line connection. 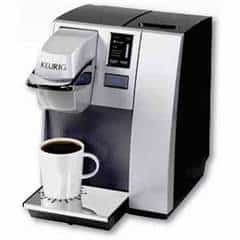 You can’t go wrong with Keurig coffee systems. Unless you just don’t like the “pod coffee” concept this is the setup I’d put in my home every time. This water-line friendly system is perfect for those of you who don’t like the idea of single cup (k-cup) coffee makers. This is a 10-cup drip coffee maker that is high end in every way. 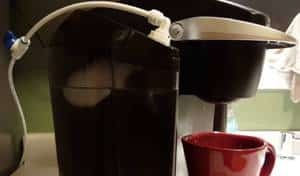 You simply connect it to your kitchen water line much like you would a refrigerator and you never have to fill the coffee pot with water again. If you can manage to hook a water filter up it to it then you’ll have the best cup of coffee possible every time for the least amount of effort. Gotta love that! It shouldn’t be a secret, either of these would make a great gift for coffee lovers! To make your own in line coffee maker all it requires is a little bit of time and a Keurig water line kit which doesn’t cost very much. Assuming you already have a reservoir brewer all you have to do is connect to water supply with the tools and accessories provided in the kit. Legitimately the hardest part of the whole process of getting your plumbed Keurig operational is to figure out how to run the line from under the sink to the top of your counter. A polished job means running it through the wall but in some kitchens it may be super easy to just drape a water line across the countertop to the coffee pot. After all those lines are usually just freely draped behind the fridge and en route to the dishwasher. Having a Keurig with water line is worth it no matter how you decide to do it though. Just get creative, you can always pretty it up at a later date. This is by far the best Keurig to run a direct water kit. This article wouldn’t be complete without mentioning this one last point. Even though the water flows through the machine all by itself you will still have to occasionally take the setup apart and clean it properly with either vinegar or a descaler. Water contains minerals that buildup in your system slowing things down and affecting the performance of the heating element. And if you want to keep the coffee oils from building up then a descaler is a must. Vinegar alone may not do the trick. This is big for those people who tend to wash the coffee pot out in the morning instead of after finishing coffee later in the day. If you really want to take full advantage of setting up a direct plumbed coffee maker then you will have to get in the habit of cleaning your pot and grind basket out before you go to bed so you don’t have to deal with the water at all in the morning. Funny thing is this is my biggest problem.